In November, watch both “Growing Up Hip Hop” and “Money. Power. Respect“on We tv for a chance to win the WE tv Growing Up Hip Hop & Money. Power. Respect Watch And Win Sweepstakes! Tune-in every week for a new Weekly Secret Code Word revealed during each show. Combine the code words together to create the Weekly Code Phrase and We tv could send you to NYC! One lucky viewer will receive a 3-day/2-night hip hop themed trip for two to New York City, complete with airfare, hotel accommodations, tickets to a hip hip themed event, dinner, and $500 spending money. The WE tv Growing Up Hip Hop & Money. Power. Respect Watch And Win Sweepstakes is open to individuals who are legal residents of the 50 United States and the District of Columbia. Additionally, all participants must be 18 years of age or older as of date of entry to be eligible to win. A maximum of one entry per entrant per Weekly Entry Period is permitted, for a maximum of 6 total entries during the entire Sweepstakes Period. The Grand Prize Winner will be selected in a random drawing from all eligible entries received during Sweepstakes Period, on or about November 23, 2016. To request the winner’s name, send a self-addressed, stamped envelope postmarked by November 30, 2016 to: WEtv Growing Up Hip Hop & Money. Power. Respect Watch & Win Sweepstakes Winners List, c/o The Promotion Pipeline, PO Box 162, Huntington Station, NY 11746 or visit wetv.com. This sweepstakes is sponsored by WETV LLC, 11 Penn Plaza, New York, NY 10001. Each week during the Sweepstakes Period, tune in to We tv and watch Growing Up Hip Hop airing on Thursdays at 9/8c for the 1st code word. Then, keep watching for Money. Power. Respect also airing on Thursdays at 10|9C for the 2nd code word. Take note of the two code words to create a the code phrase. Once you have the weekly code phrase, visit www.wetv.com/extras/hip-hop-power-up-sweeps then follow the instructions to complete and submit the entry form. Each correct weekly code phrase results in 1 Sweepstakes Entry. New secret weekly code words will be revealed every Thursday for 6 weeks so be sure to tune-in every week for more chances to win. 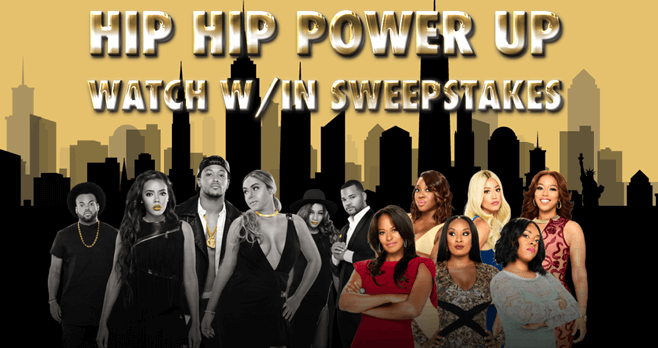 For complete details, including Official Rules, visit www.wetv.com/extras/hip-hop-power-up-sweeps.